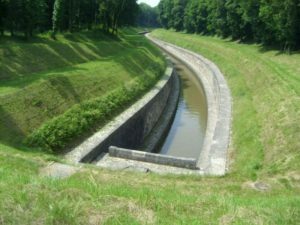 Chateau Thierry to the canal lateral a la Marne. After Chateau Thierry we headed to Epernay where I finally collected my bicycle trailer. Before entering the canal lateral a la Marne we stayed a night at Epernay because I wanted to continued up the river as far as the next bridge. This bridge marks the limit of navigation on this beautiful river. 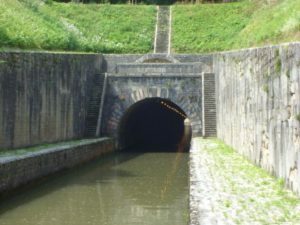 The next day we entered the canal lateral a la Marne which is in keeping with the French tradition of giving their canals very long names. At Mareuil sur Ay by chance we met an English couple who were in a camper van. Later they joined us for a quiet drink and a chat. Reg and Doreen are a lovely retired couple. Reg’s hobby is brewing; he has made rum from a courgette and some brown sugar, wine from his own grapes and beer from the by-products of a local farm. It seems that Reg has the ability to turn anything into an alcoholic beverage. I hope it never happens but if you ever find yourself in prison, Reg is the sort of cellmate you would want. 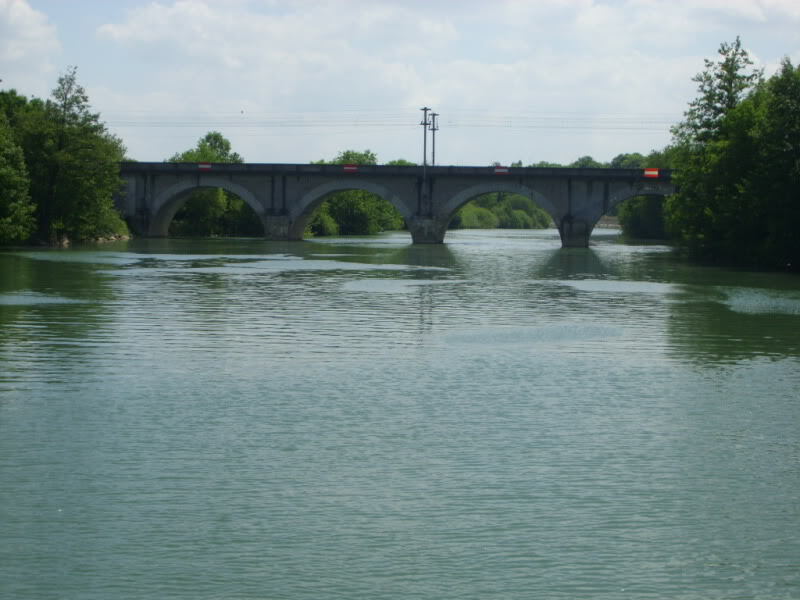 Staying on the canal lateral a la Marne we approached Vitry le Francois this morning and we’re looking forward to finding some boats and a bit of company. The last lock before the town is unusual in that the lock chamber is surrounded by an eight foot fence and some razor wire. The approach to the town is anything but welcoming. There is a cold and slightly sinister atmosphere. There is also plenty more of the eight foot fencing which by the way failed to stop the shopping trolleys from being thrown into the canal. I have to take my hat off to them for getting the trolls over such a high fence though. Eventually we come to a row of liveaboards. Here a small English narrow boat with a disproportionate amount of car on the back deck has moored up for a few days to make repairs (to the boat that is not the car… I think). 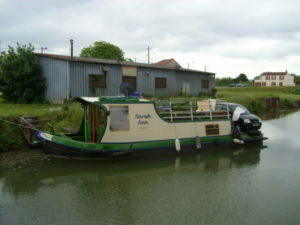 The English lady’s narrow boat with her car on the deck. The woman onboard comes out on deck to warn us to be very careful. “They just stole my two bicycles about half an hour ago” We moored up and I made a quick dash to Lidl while Mar guarded our bikes. The town probably looks lovely if you enter it by a different route but from the canal lateral a la Marne it is not a welcoming sight. I would not feel comfortable staying over night here which is a pity really. As soon as you’re out of Vitry le Francois the canal changes dramatically into a beautiful tree lined watery avenue with noticeably lower levels of intimidation. Vitry le Francois is the confluence of three canals: The canal a la lateral a la Marne, The canal de la Marne a la Saone, and The Canal Marne au Rhin. We are on the latter now. In the water today we saw another dead deer the third in as many days. In fact we have seen more dead deer than live boaters which in itself is an interesting statistic. 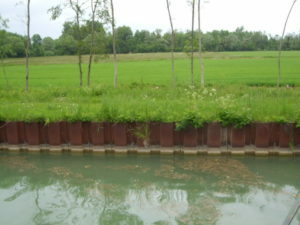 The steel shuttering along the canal bank means that once an animal falls in (and let’s include humans in that) they cannot get out unaided. 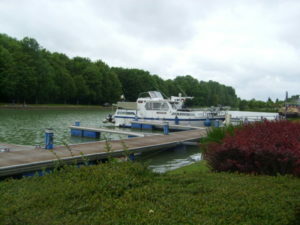 In the small and very nice port of Pargny sur Saulx things start to change and we find other boaters. Suddenly they are everywhere, pleasure boats and commercials. The canal is alive once again. We pass through the wonderful tunnels at Mauvages and what a marvellous engineering achievement they are with beautiful stone work too. The wonderful stonework at the tunnel entrance. It takes a full hour and a half to go through this last tunnel. The VNF send this electric tug boat ahead of you and it’s supposed to tow you. To be perfectly honest it doesn’t really tow you because you have no steering when you’re being towed. So you just follow along behind. It pulls itself along on that chain that lies on the bottom of the canal. Trust me you cannot imagine the noise it makes and how that adds to the claustrophobia. 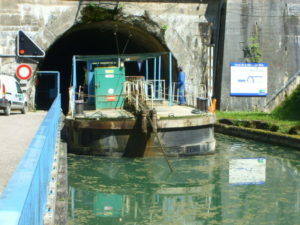 I wish I was back on the canal lateral a la Marne now! 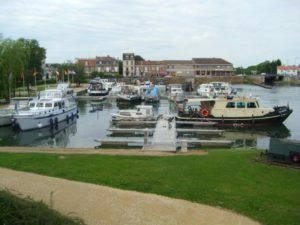 We arrive into the town of Toul and moored up for a few days in this fine marina. I was glad to be finished with tunnels for a while. Then a very nice French lady introduced herself to us. She explained that she had been on a boating holiday on the river Shannon in Ireland and that she loved it. She even gave us a lift into town to do our shopping. It’s lovely to meet nice people like that, that’s what makes this boating such a wonderful experience.